A Seoul court will hold a hearing Wednesday to decide whether to issue an arrest warrant for former Supreme Court Chief Justice Yang Sung-tae over a massive power abuse scandal involving the country's top court. Yang, 71, is due to appear at the Seoul Central District Court for a 10:30 a.m. hearing. Prosecutors filed for his arrest warrant last Friday. The former top court chief from 2011-2017 stands accused of using or seeking to use trials as political leverage to lobby the office of then-President Park Geun-hye to get her approval for the establishment of a separate court of appeals, his pet project. He is the first former head of South Korea's Supreme Court to have faced questioning as a criminal suspect and be on the verge of being placed under presentencing detention. He has undergone three separate interrogations this month. The scandal involving top justices and the top court has rattled the country, placing the judiciary under unprecedented scrutiny. Yang faces at least 40 counts, including abuse of power and leaking of state secrets. 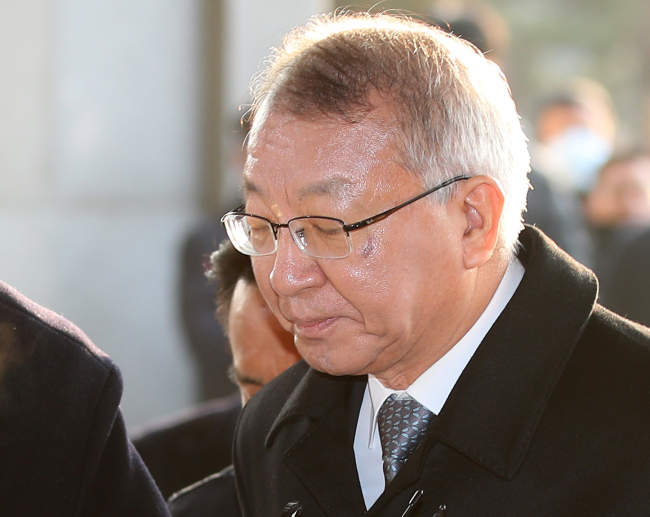 The retired veteran justice is alleged to have instructed his officials at the National Court Administration, the top court's governing body, to devise ways to interfere in trials whose rulings potentially held high political significance for Park. He is also accused of having orchestrated a delay in the deliberation of a damages suit filed by Korean victims of Japan's wartime forced labor to curry favor with the former president, who was seeking amicable relations with Tokyo. He allegedly pressured judges in charge of such trials to deliver verdicts in Park's favor and disadvantaged the judges who were opposed to establishing another appeals court.